Only one more adventure remained before we said our final good-bye to Antarctica. In early afternoon we arrived at Aitcho, a tiny island whose funny name came from the letters H.O., abbreviation, we were told, for the British Hydrographic Office. 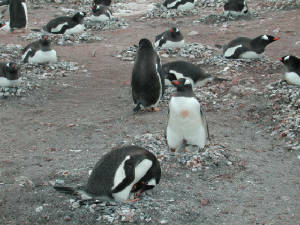 At first glance Aitcho appeared to be a typical penguin rookery. Crowds of penguins huddled on the slope, and a curious mixed delegation of chinstraps and gentoos came down to meet us. Gentoos here seemed dominant. Slightly larger than their cousins, the chinstraps and Adelies, gentoos are distinguished by their bright orange beaks and a white spot on each side of their head, approximately where their ears would be. 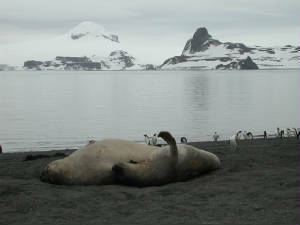 Gentoos occupied the beach property while the chinstraps huddled higher up the slopes. Here the chicks were very newly hatched. We saw tiny, insistent beaks thrust up from under the penguin parent’s belly, begging for food. The brooding mothers (or fathers) had all they could do to keep their wriggling offspring covered. But there was more to Aitcho Island. A remarkable scene unfolded before us as we crossed the top of the island. A leopard seal had pulled out on the beach and lay there, apparently asleep. Leopard seals are one of the most voracious predators in Antarctic waters, the archenemies of penguins. Whether from bravado or curiosity, a group of chinstraps stood on the beach nearby, apparently watching while one or two daring penguins edged within a yard of the seal’s terrible mouth. We had a chance to see what that mouth might do when the seal shifted and gave a great, gaping yawn showing his sharp, penguin-killing teeth. At the moment he was more interested in sleeping than eating penguins. 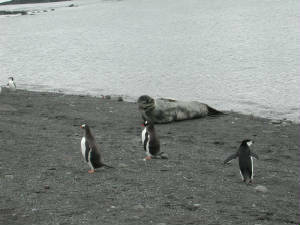 Just beyond the leopard seal were four huge brown humps, which turned out to be elephant seals. The enormous, ungainly creatures, some of them already weighing a ton or more, huddled together for companionship and warmth. These were juvenile males, the largest of them less than half his expected adult weight. They seemed to have little interest in the penguins or us. On the beach, apparently, it was live and let live. Looking out over the shore from Aitcho we had a view of sharp peaks and glaciers, one of the most sublimely beautiful landscapes we had seen in Antarctica. We stood for a while just admiring the scenery and watching the penguins porpoise across the lagoon – propelling themselves in and out of the water in the fastest of all penguin swimming techniques. This movement, I read, is particularly good for evading predators. While a leopard seal is capable of swimming faster than the penguin, the birds are able to change course during their leap out of the water, re-entering in a different direction and confusing any submarine creature that might be chasing them. I learned later that another type of water activity had been taking place just out of sight and around the bend. Some of the passengers had brought along swimming suits, expecting to take advantage of the hot springs at Deception Island, a point normally on the Explorer’s itinerary. When the course shifted to the Weddell Sea, they lost their swimming opportunity, but now they were determined to make it up. Now we were spared the usual snowball battle because most of the younger set had trooped off to a “swimming beach” on the far side of the island where several of them actually went for a dip in the ocean – a dip that lasted perhaps 10 seconds and earned them a place in the annals of aquatic sports activity in Antarctica. As we entered our zodiacs for the final ride back to the ship, we found it hard to believe that we were leaving this beautiful and challenging place that both tested and rewarded us so richly.